Ron Hextall, left, and left winger James van Riemsdyk are shown during a news conference after he signed with the team this summer. Van Riemsdyk’s injury has left a major void in the team’s identity. NHL teams, especially the good ones, develop some sort of positive identity. The Flyers, however, have been searching for one ever since Dave Haktsol became the head coach four seasons ago. They're not among the league's most physical or fast teams. They're not a team that overwhelms you with its ability to shut down an opponent. They're not a team whose underachieving power play or penalty kill (ugh) will dazzle anyone. 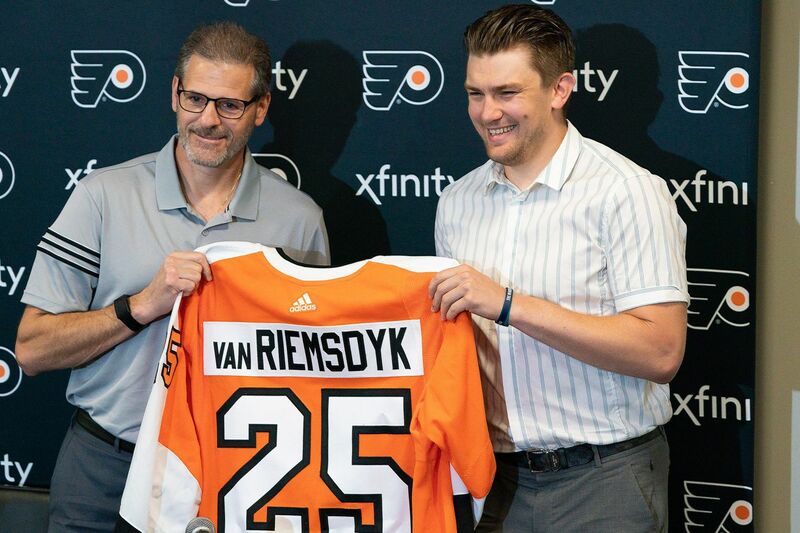 When the Flyers signed high-scoring left winger James van Riemsdyk in the offseason, many thought their identity would be this: an explosive team that would never be out of a game because of its dangerous attack. After all, how many NHL teams had a third line that included two players (van Riemsdyk and Wayne Simmonds) with the ability to score 30 goals apiece? A swarming attack might still become their identity, but it's been put on the back burner because van Riemsdyk suffered a knee injury that will sideline him for at least five weeks, weakening the offense and taking away balance on the two power-play units. Maybe by late November or early December, when van Riemsdyk is back to form, the Flyers will be filling up nets at an alarming rate and their defense will have plugged its many holes. But for the time being, their identity is this: If you want defensive blunders, if you want a team that hands out odd-man rushes like Halloween candy, if you want goalies whose goals-against averages are twice as high as Bernie Parent's in his prime, go watch the Flyers. "It's got to stop, this high-risk, almost summer hockey," center Sean Couturier said of the team's dangerously wide-open play following Thursday's 6-3 loss in Columbus. "It's getting out of hand here." Entering Saturday, the Flyers had allowed 31 goals, the league's second-highest total. The goalies have struggled, but not even Parent would excel with the defensive mistakes made by this team in the first two-plus weeks. Maybe the young defense will mature and reduce the miscues. Maybe Michal Neuvirth will soon return from a suspected groin injury and steady the shaky goaltending. Maybe the forwards will eliminate the unforced turnovers that, in the first seven games, frequently led to a puck going past Brian Elliott or Cal Pickard. San Jose Sharks Timo Meier scores between the legs of Flyers goalie Brian Elliott Tuesday, October 9, 2018. The Flyers lost to the Sharks 8-2 in their home opener. The Flyers, who have yet to win consecutive games, want a different identity from the one they have shown. "We want to be a hardworking team, but we want to be a skilled team – and we want to be a team that's hard to play against every night," general manager Ron Hextall said. "Today's 'hard to play against' is a lot different than it was 20 years ago. It's not beating a team up or necessarily running [someone] through the boards. It's having a lot of puck pressure on the opposing team, and that's hard to play against." In the season's first two-plus weeks – and during most of Hakstol's tenure – the Flyers have done that at times, but not consistently enough to make it their identity. One period they swarm all over their opponent, but all too frequently, the next period is the exact opposite. Complacency sets in and too many Grade-A chances are allowed. "We need more consistent execution," Hextall said. Hakstol, whose arrival from the college ranks was greeted by a 78 percent approval rating in a 2015 philly.com poll, says he wants his team to be known as one that plays 60 hard minutes, game in and game out. "You show your identity over 82 games, over what you do through ups and downs, and what the result is at the end of that 82-game schedule," he said. When van Riemsdyk returns, Hakstol wouldn't mind if the Flyers developed into one of the league's highest-scoring teams. But he doesn't want that to be their identity. "It's not a successful formula," he said. "At some point in time, depth in scoring is really important because it gets really hard to score in this league the deeper you go into the regular season. That has to be part of your identity – to get different contributions from different areas of your lineup. But at the end of the day, you don't score your way through this league. You have to be a complete 200-foot hockey team to have success on a long-term basis." So far, there have been too many times they have been just a 100-foot team. There have been too many defensive breakdowns, too many saves their goalies haven't made. The good news: They have almost six months to get it right. "There's a fine line between confident and cocky, and I think our team has that confidence," said Travis Konecny, the speedy right winger who is arguably the Flyers' most exciting player to watch. "We know we have the ability to come in every night and give every team a run for their money. That's what we need to have and we're building that as we go along."